In general, initiation of stress fiber formation is modulated by signaling cascades involving RhoA small GTPase  (reviewed in ). Most G-actin polymerization is driven by the actin polymerizing machinery at the barbed end of actin filaments, presumably at the interface between the cell membrane and the underlying filament network abutting the membrane ; these barbed ends are created by uncapping or severing existing filaments in the lamellipodium or by de novo nucleation. The actin filaments in transverse arcs are primarily nucleated in the lamellipodia by the Arp2/3 complex at a position that is parallel to the leading edge . Although effectors of RhoA signaling such as formin (e.g., mDia1) have also been suggested to nucleate actin filaments in stress fibers , they are not a primary contributor to transverse arc initiation and assembly . It has been suggested that stress fibers may also form as a result of F-actin stabilization brought about by filament bundling and merging . Consistent with this notion, actin filament bundles in filopodia were found to serve as precursors of arc-like filaments, stress fibers and graded polarity bundles . Most of the initiated filaments in the lamellipodia have their barbed ends facing the nearest cell edge. 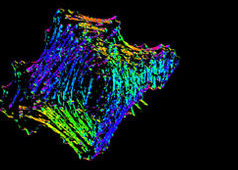 However, the polarity of the actin filaments becomes mixed as the arcs mature towards the cell center ; precisely how this is achieved is unknown. Once initiated in the lamellipodium, the actin filaments are extended rapidly from their barbed ends. These are commonly situated at the leading edge , and fewer free filament ends are found in the deeper regions of the lamellipodium . There is subsequent rearward transport of the actin filaments towards the cell body  (reviewed in ). An arc usually develops from and is positioned just beneath the dorsal surface of the lamella . In the cases where there are periodic contractions of the lamellipodium, early arcs form over myosin filaments . During their maturation however, the bundles may attain positions that are equally distributed between the ventral and middle sections of the cell . Although the filaments are swept centripetally and they lack direct contact with the substrate , the site of initiation remains stationary relative to the substrate and the orientation of the filaments may change ; thus, lateral flow may foster the assembly of anti-parallel filament arrays (reviewed in ). As the transverse arc filaments are pulled inward, they are rapidly bound and stabilized by actin binding proteins, such as α-actinin, which crosslinks the arc filaments into small bundles . Similar to other cortical actin networks that are composed of actin bundles (e.g., microvilli, stereocilia), the contraction of transverse arcs at the bundle tip would presumably contribute to: the retrograde flow of actin within the bundle ; recruitment of additional proteins (e.g., filamin); and condensation of the transverse arc into larger structures as they are moved towards the cell body . Arc-like bundles may also form from microspikes and filopodia bundles that have been recruited from the lamellipodium in the course of rearward flow . Transverse arcs appear to coalesce from short actin bundles that are generated at the lamellipodial leading edge . The assembly of myosin II into thick filaments also preferentially begins in the region immediately behind the leading edge as it retracts (even in the absence of net protrusion) . The transverse arcs mature as the filaments are moved centripetally into the more stable regions of the lamellum . 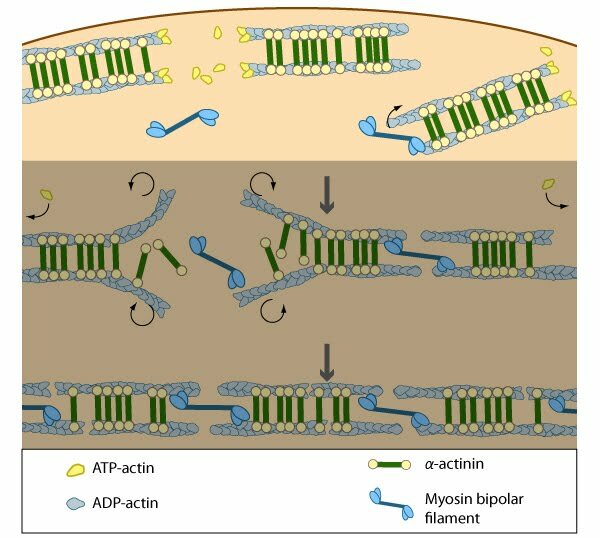 As they are transported, the myosin bundles associate with the loose bundles of actin filaments and become flanked by dense bodies of α-actinin ; the spacing between the bands of α-actinin varies between cell types  and the organization and localization of α-actinin along the filaments is thought to follow myosin assembly . Transverse arcs fully evolve from end-to-end annealing of α-actinin and myosin containing bundles ; end-to-end annealing has also been observed in the formation of bundles that resemble ventral stress fibers . 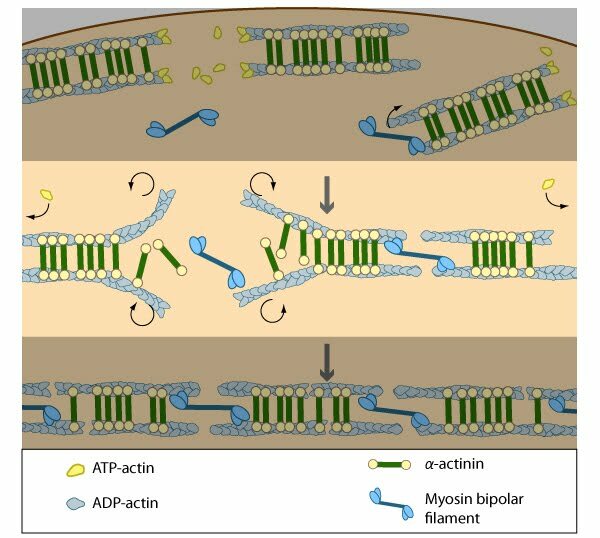 It has been suggested that tension generated by the actin-myosin arrangement and myosin II motor activity causes alignment of the actin filaments into these bundles  in a manner similar to the reorientation of lamellipodial and filopodial actin filaments during cell migration . Furthermore, in order for stress fibers to be contractile, the unipolar assembly of actin filaments must change to mixed polarity bundles in mature stress fibers ; how this is specifically achieved is unknown, but based on experiments using purified components , permeabilized cells  and live cells , it has been suggested that myosin bundles may recruit the filaments and facilitate polarity sorting  (reviewed in ). Interestingly, the assembly of transverse arcs and dorsal stress fibers appears to be connected: transverse arcs encounter dorsal stress fibers as they are transported towards the cell body via actin-myosin contractions . Contraction of the actin-myosin system allows the filaments to adopt a more regular structure that is contractile along its entire length; the extent of actin filament crosslinking may regulate these contractions. Myosin II motor protein activity is necessary for complete transverse arc formation (figure adapted from ). As the crosslinked filaments are joined together to form long bundles, transverse arcs are fortified with myosin II and the width between alternating bands of α-actinin and myosin thick filaments is equalized . 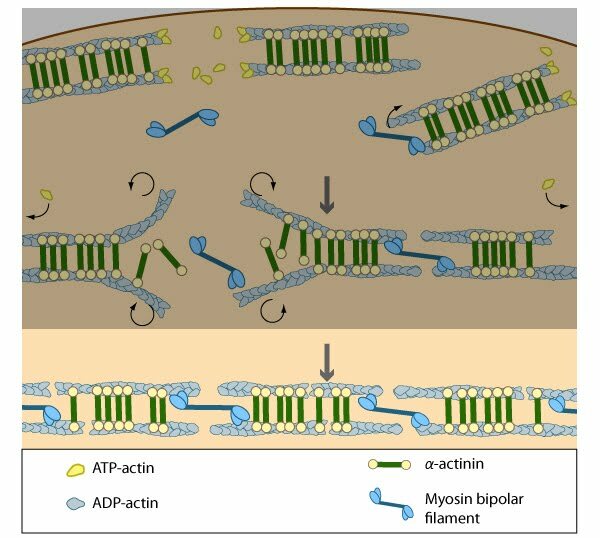 Although not directly demonstrated, it is reasonable to suggest that the actin-myosin interaction and initiation of myosin II-dependent contractions fosters this alignment . In line with the concept that contractile activity influences the structural organization of the cytoskeleton, the transverse arcs disassemble when the actin filaments are no longer held in place by contractile tension and the myosin II bundles . Furthermore, both contraction strength  and regulation of myosin II activity  correlate with stress fiber formation and they regulate the overall stability and integrity of stress fibers . The extent of contraction also directly correlates with altered transcription of certain genes . Finally, there is a reciprocal relationship between the strength of contractions and changes in cell morphology: cell morphology contributes to the formation of stress fibers and the resulting magnitude of contractile force that can be generated , while in reverse, the extent of contractions will influence the cell morphology . Although transverse arcs are not connected directly to focal adhesions , the contractile forces produced in transverse arcs can presumably be transmitted to the cell-substrate interface indirectly through the dorsal stress fibers and their associated focal adhesions. 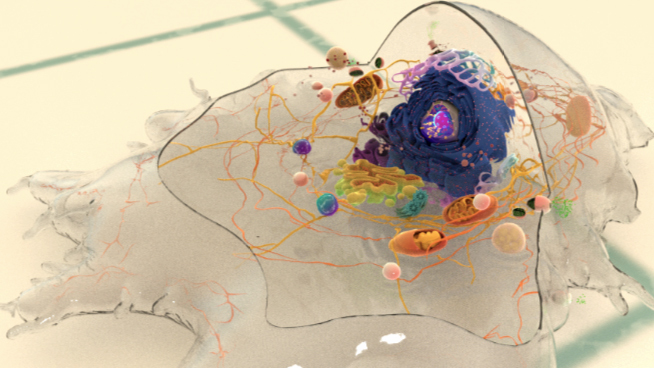 Whether this predicted force transmission actually leads to extracellular remodeling, is relatively unexplored.